IC Progress provides the best construction site documentation services including photographic, video and time lapse documentation. 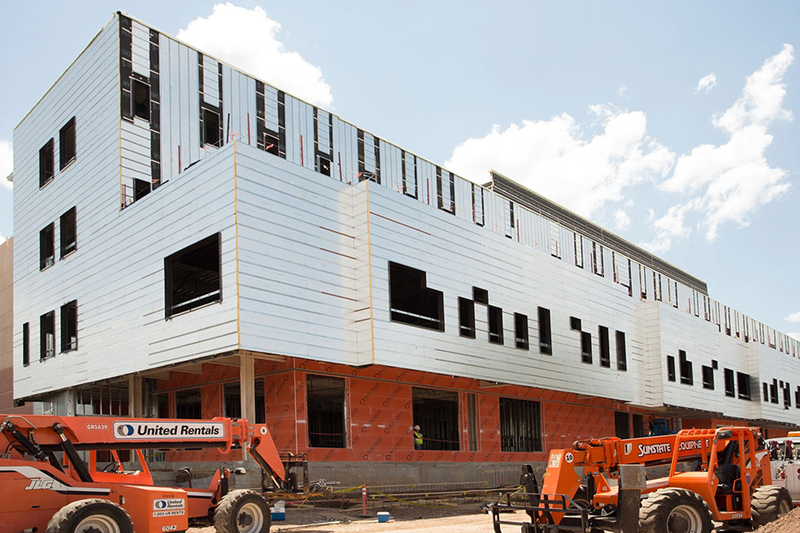 Progress photographs beginning with Pre-Construction Photography are the most significant part of construction documentation and act as your visual insurance policy. You should not be held responsible for damage to neighboring properties that existed prior to construction. Without photographic proof of existing conditions, you may be held accountable. Have IC Progress document your site before you get started with any work. 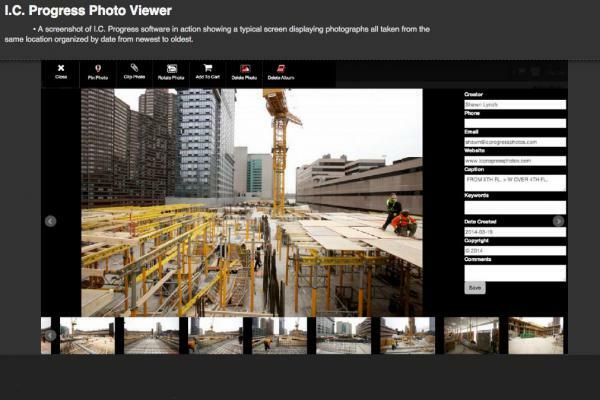 Progress video adds another layer of protection when documenting your job site. Our online software platform gives you the tools you need to get the job done in a timely, affordable fashion. Our simple three-step process, “Pin it, Click it, Ship it,” increases your efficiency and workflow. Just upload your files (floor plans, photos, documentation) to our system and begin pinning photos onto corresponding drawings. Next, simply clip any relevant documentation to that photo. Once you’re done, you can ship out an email, completely organized, with everything your contractors need to know.This is the only fully digital service available with everything you need in one place. No more switching between platforms or dealing with digital versus analog files. See your project come to life. Time lapse and now “hyper lapse” photography offer a great way to speed up gradual changes. 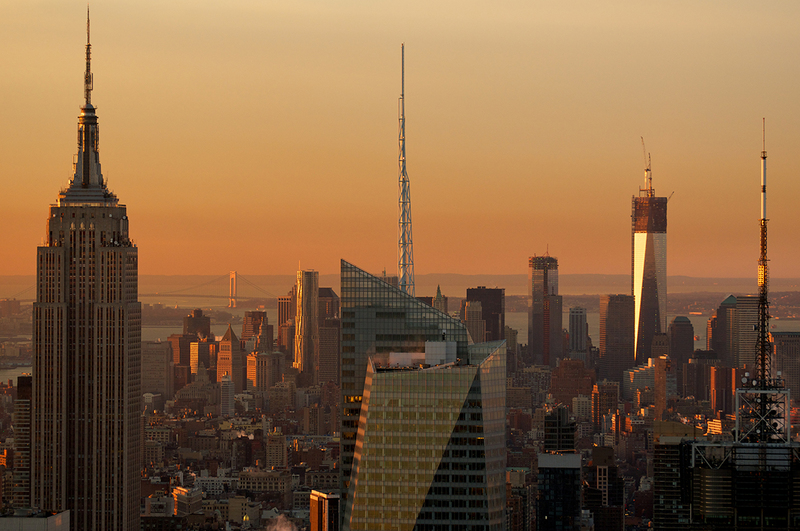 IC Progress will help you select a vantage point for your project that will clearly captures the action as your job progresses. An aerial perspective is instrumental in showing detail that cannot be seen from ground level. Taking pictures across the deck of a new building does not demonstrate things like where utilities will be buried. Only when you get the camera high enough overhead can you really see some of these important details With our new drones we can get closer to the action and provide unique perspectives that were previously impossible. 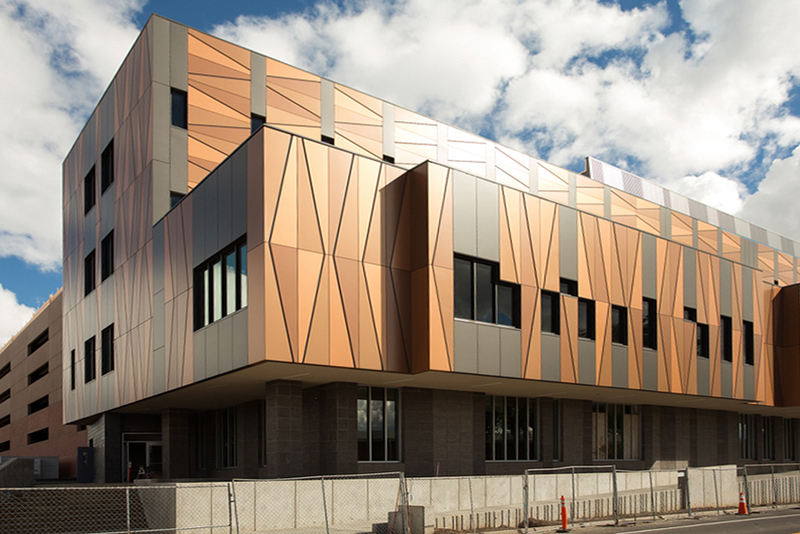 “IC Progress has been providing us with an excellent record for the progress of our project. Their online software is very user friendly and provides quick access to the photographic record of the project. We are able to use these photos in our reports to the client and it provides a seamless way to demonstrate how the project has progressed. “We are able to take pictures each week from the same vantage point, pin them on the drawings, and monitor the construction progress. The program acts as an efficient photo cataloging tool. This is also a great tool which we share with our clients. “It is my pleasure to recommend IC Progress as one of the most reliable firms in their industry. 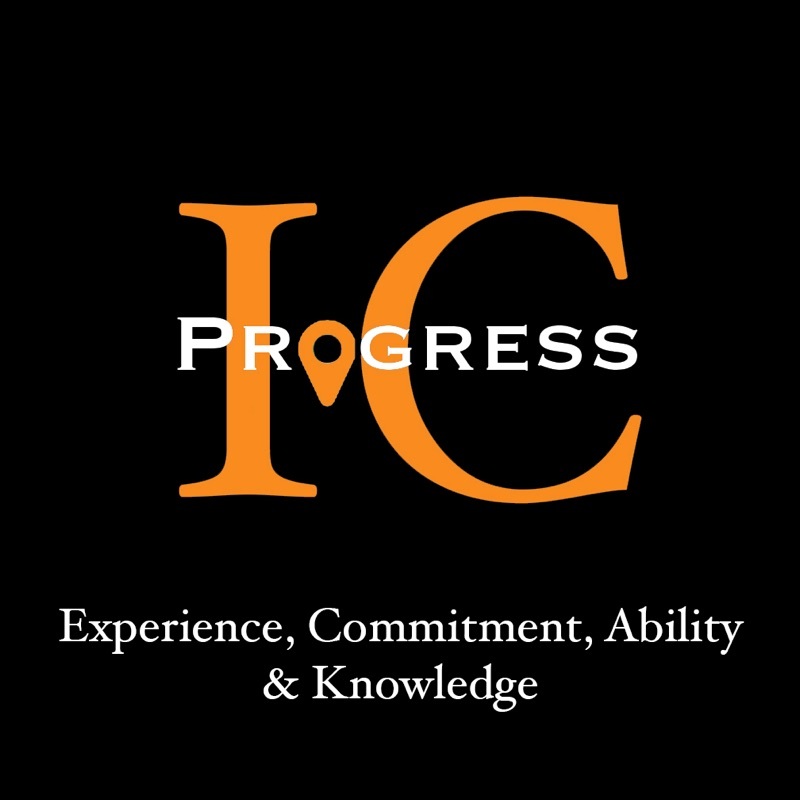 A colleague introduced me to IC Progress last year when I needed specialized photos taken of a construction site. Since meeting with the owner and his team, I have been consistently impressed with the level of professionalism they use. We now regularly rely on their promptness and quality during all phases of construction. We have also begun working with them to show our finished spaces, for marketing purposes. The photos always turn out beautiful with the right color and image resolution. Their electronic software is also incredibly organized and user friendly. The site allows you to view photos in a way that I have not seen before. It is a brilliant system. “It is a privilege to be given the opportunity to provide a recommendation for IC Progress Photography. 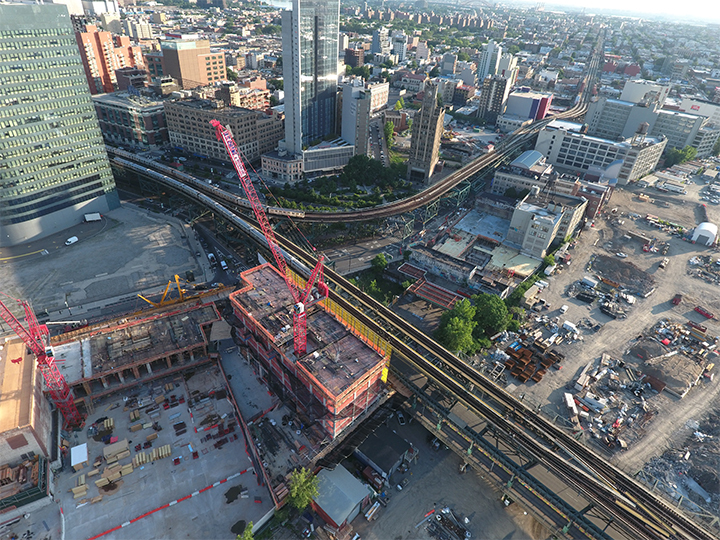 I have used IC Progress for two construction projects for the LIU Brooklyn Campus Capital Projects Department for construction progress photography and documentation. Our department has begun to seeking photography documentation services after experiencing issues with the performance of work performed by general contractors that were procured by the university. In addition, such services were beneficial for university archival & recordkeeping. Other documentation firms fail to document or label photos that were taken on the field and lack the resources to pin documentation photos to an electronic construction document. We have engaged IC Progress photography for these particular services and are extremely satisfied customers. Reach out and try it for yourself. No matter how big the job, our services will make documenting and tracking progress easier. IC Progress is the world's finest construction site documentation company. Our revolutionary software platform makes keeping track of all your documents, drawings and photos simple by combining an efficient workflow with logical organization. No more searching endlessly for misplaced documents. Now with a few clicks you can find and share all the information you need. You hereby represent to the Company that you have ownership, license, and/or authority to post and use any and all user content uploaded, posted, or otherwise submitted to the website by you. You represent, warrant and covenant that you shall not upload, post or transmit to or distribute or otherwise publish through the website any materials which: (i) restrict or inhibit any other user from using and enjoying the Website; (ii) are unlawful, threatening, abusive, libelous, defamatory, obscene, vulgar, offensive, pornographic, profane, sexually explicit or indecent; (iii) constitute or encourage conduct that would constitute a criminal offense, give rise to civil liability or otherwise violate any law or governmental regulation; (iv) violate, plagiarize or infringe the rights of third parties including, without limitation, copyright, trademark, patent, rights of privacy or publicity or any other proprietary right; (v) contain a virus or other harmful or destructive elements; (vi) contain any information, software or other material of a commercial nature; (vii) contain advertising of any kind; or (viii) constitute or contain false or misleading indications of origin or statements of fact. Your user content must not be illegal or unlawful, must not infringe any third party's legal rights, and must not be capable of giving rise to legal action whether against you or the Company or a third party (in each case under any applicable law). You covenant and agree, at your sole cost and expense, to indemnify, protect and save the Company harmless against and from any and all Indemnified Losses which may at any time be imposed upon, incurred by or awarded against the Company arising from, out of, attributable to or by reason of, your use of the website or arising out of the user content. “Indemnified Losses” shall mean Incurred damages, losses, liabilities, costs and expenses, obligations, penalties, fines, impositions, fees, levies, lien removal or bonding costs, claims, litigation, demands, defenses, judgments, suits, proceedings, costs, disbursements or expenses (including, without limitation, attorneys' and experts' reasonable fees and disbursements) of any kind and nature whatsoever. THE COMPANY WEBSITE, INCLUDING ALL CONTENT, SOFTWARE, FUNCTIONS, MATERIALS AND INFORMATION MADE AVAILABLE ON OR ACCESSED THROUGH THE WEBSITE, IS PROVIDED ON AN "AS IS" BASIS. TO THE FULLEST EXTENT PERMISSIBLE BY LAW, THE COMPANY MAKES NO REPRESENTATION OR WARRANTIES OF ANY KIND WHATSOEVER FOR THE CONTENT ON THE WEBSITE OR THE MATERIALS, INFORMATION AND FUNCTIONS MADE ACCESSIBLE BY THE SOFTWARE USED ON OR ACCESSED THROUGH THE WEBSITE, FOR ANY HYPERTEXT LINKS TO THIRD PARTY WEBSITES OR FOR ANY BREACH OF SECURITY ASSOCIATED WITH THE TRANSMISSION OF SENSITIVE INFORMATION THROUGH THE WEBSITE OR ANY LINKED SITE. FURTHER, THE COMPANY DISCLAIMS ANY EXPRESS OR IMPLIED WARRANTIES, INCLUDING, WITHOUT LIMITATION, MERCHANTABILITY, FITNESS FOR A PARTICULAR PURPOSE AND NON-INFRINGEMENT. THE COMPANY DOES NOT WARRANT THAT THE FUNCTIONS CONTAINED IN THE WEBSITE OR ANY MATERIALS OR CONTENT CONTAINED THEREIN WILL BE UNINTERRUPTED, ERROR FREE OR THAT DEFECTS WILL BE CORRECTED, OR THAT THE COMPANY WEBSITE OR THE SERVER THAT MAKES IT AVAILABLE IS FREE OF VIRUSES OR OTHER HARMFUL COMPONENTS. THE COMPANY SHALL NOT BE LIABLE FOR THE USE OF THE WEBSITE, INCLUDING, WITHOUT LIMITATION, THE CONTENT AND ANY ERRORS CONTAINED THEREIN. TO THE FULLEST EXTENT PERMISSIBLE BY LAW, THE COMPANY SHALL NOT BE LIABLE TO YOU FOR ANY DIRECT, INDIRECT, PUNITIVE, INCIDENTAL, SPECIAL OR CONSEQUENTIAL DAMAGES ARISING OUT OF OR IN ANY WAY CONNECTED WITH THE USE OF OR ACCESS TO THE WEBSITE OR FOR ANY INFORMATION OBTAINED THROUGH THE WEBSITE, WHETHER BASED ON CONTRACT, TORT, STRICT LIABILITY OR OTHERWISE, EVEN IF THE COMPANY OR ANY OF ITS AGENTS HAS BEEN ADVISED OF THE POSSIBILITY OF DAMAGES TO THE FULLEST EXTENT PERMISSIBLE BY LAW. By posting these images, data, media, or any other information (the “content”) to the website or to I.C. Progress, Inc., you hereby (1) warrant and represent that you have title, ownership interest, a license, or other authority to post and/or distribute the content, (2) grant to the I.C. Progress, Inc. a worldwide, irrevocable, non-exclusive, royalty-free license to use, reproduce, adapt, publish, translate and distribute the content, (3) grant to I.C. Progress, Inc. the right to sub-license these rights, and the right to bring an action for infringement of these rights, (4) represent, warrant and covenant that your posting or transmittal of the content does not: (i) restrict or inhibit any other user from using and enjoying the Website; (ii) are unlawful, threatening, abusive, libelous, defamatory, obscene, vulgar, offensive, pornographic, profane, sexually explicit or indecent; (iii) constitute or encourage conduct that would constitute a criminal offense, give rise to civil liability or otherwise violate any law or governmental regulation; (iv) violate, plagiarize or infringe the rights of third parties including, without limitation, copyright, trademark, patent, rights of privacy or publicity or any other proprietary right; (v) contain a virus or other harmful or destructive elements; (vi) contain any information, software or other material of a commercial nature; (vii) contain advertising of any kind; or (viii) constitute or contain false or misleading indications of origin or statements of fact, and (5) agree, at your sole cost and expense, to indemnify, protect and save I.C. Progress, Inc. harmless against and from any and all Indemnified Losses which may at any time be imposed upon, incurred by or awarded against I.C. Progress, Inc. arising from, out of, attributable to or by reason of, your use of the website or arising out of the user content. “Indemnified Losses” shall mean Incurred damages, losses, liabilities, costs and expenses, obligations, penalties, fines, impositions, fees, levies, lien removal or bonding costs, claims, litigation, demands, defenses, judgments, suits, proceedings, costs, disbursements or expenses (including, without limitation, attorneys' and experts' reasonable fees and disbursements) of any kind and nature whatsoever. By requesting that the images, data, media, or any other information (the “content”) be removed from the website, you hereby (1) warrant and represent to I.C. Progress, Inc., that you have title, ownership interest, or exclusive license to make such a request; and (2) agree, at your sole cost and expense, to indemnify, protect and save I.C. Progress, Inc. harmless against and from any and all Indemnified Losses which may at any time be imposed upon, incurred by or awarded against I.C. Progress, Inc. arising from, out of, attributable to or by reason of, your use of the website or arising out of your request for the removal of any content. “Indemnified Losses” shall mean Incurred damages, losses, liabilities, costs and expenses, obligations, penalties, fines, impositions, fees, levies, lien removal or bonding costs, claims, litigation, demands, defenses, judgments, suits, proceedings, costs, disbursements or expenses (including, without limitation, attorneys' and experts' reasonable fees and disbursements) of any kind and nature whatsoever.